We enjoyed our stay here. Even during bad wheather it was a cosy place that made our stay in Rome really special! We noticed that the apartment could be given a bit of an upgrade for the price. The RomeLoft staff were excellent as usual. Only suggestion would be to upgrade the plumbing and faucets. Very low water pressure made it hard to wash hands. Shower head had build up and was not flowing at full capacity. Otherwise very charming and comfortable! L'appartement correspond à la desçription et la vue est magnifique. Il mériterait un rafraîchissement pour avoir encore plus de charme. Bon accueil par Romeloft, aucune difficulté. Une valeur sûre. We feel it was a great find for the amazing views. Not out of the way at all, but be prepared to climb up and down a steep road. It's worth it when you get there! The apartment itself is all about the terrace and views, though the interior could use a little updating. The staff was very attentive. 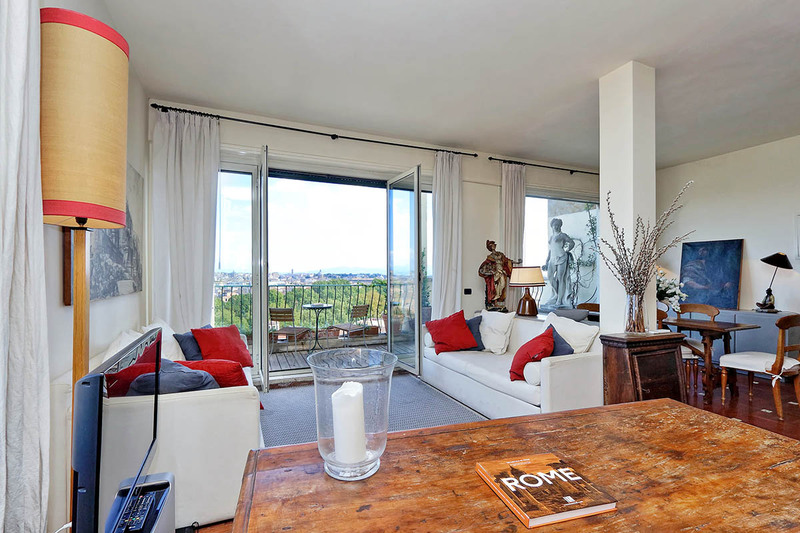 The apartment was ideally located between all areas of Rome we wanted to visit. The amenities, the comfort, the helpful staff, and the views! …all helped to make the Rome leg of our trip THE most memorable. 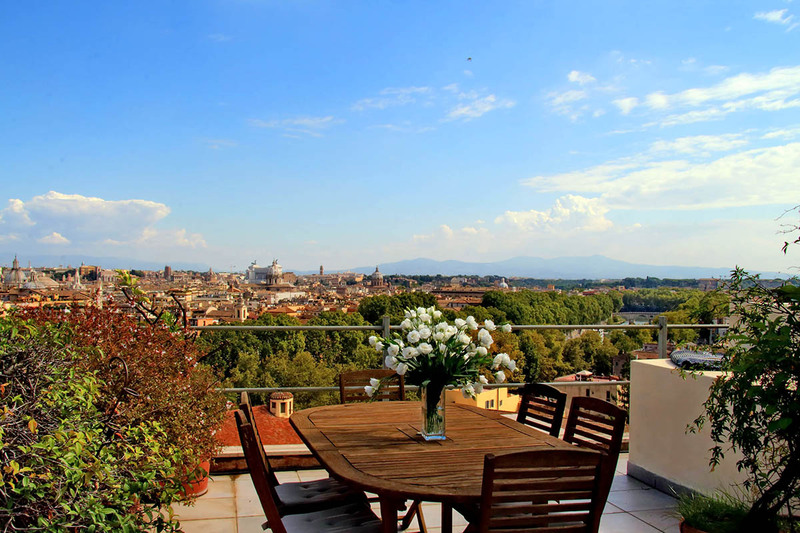 We will definitely rent this unit again upon returning to Rome. The views were magnificent. We walked in a day to Castel di Angelus, shops, the Pantheon, and the Coliseum. Everything we could see we could walk to. 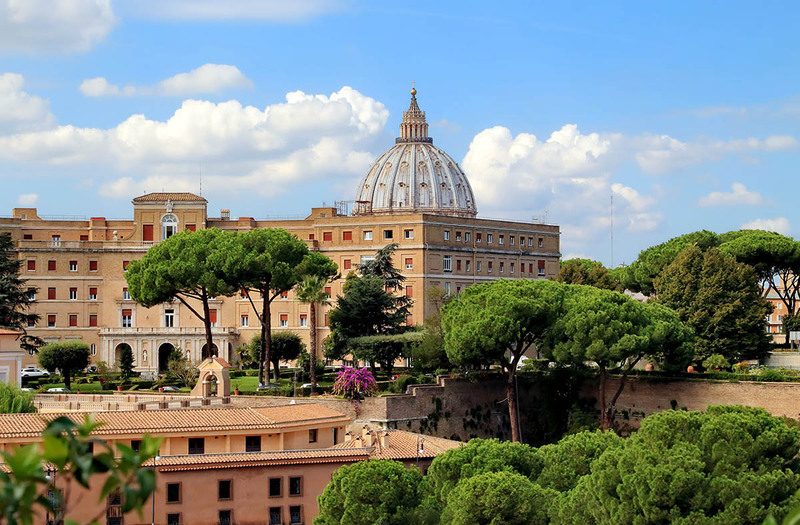 The Vatican was only 7 minutes away on foot. The apartment is very comfortable and spacious. we had great time at this beautiful place ! 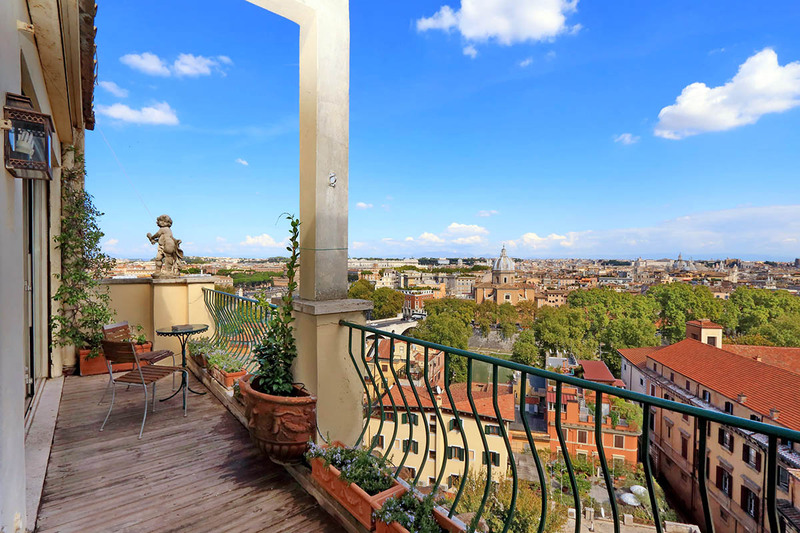 12 people are currently looking for apartments in Trastevere area. Reserve yours now. Linge de maison et les serviettes sont inclus..
Si cet appartement ressemble à une option intéressante pour vous, contactez- nous maintenant! We generally enjoyed the apartment with its beautiful ambiance and comfort. The handover of keys went very smoothly - with the staff member responsible being on time. However, as I explained previously, there were a couple of problems. I had asked for two beds but only one was made up and no spare sheets were available. A staff member arranged f...Read Moreor a maid to come the next day and make up a bed - and we appreciated that. We couldn't work out how to use the stove - and rang the contact person for assistance. He didn't know how to use the stove. And when we eventually worked it out the next morning,it turned out that only one of the burners was working anyway. I believe the staff member I contacted has been reported it so that it can be fixed. Thanks to Juliana who sorted these things out for us. This is really one of those apartments for a special occasion. It's not particularly "up-scale" but its position on this hill is really extraordinary. We celebrated a 50th Birthday here and it was perfect. 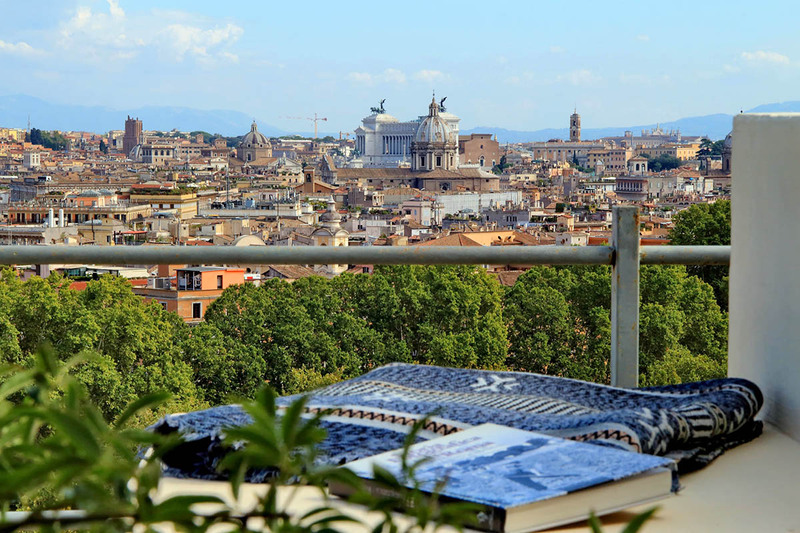 We had a chef come in and cook for 8 of us up on the roof terrace and it was like being on a movie set - St. Peter's Basi...Read Morelica on one side, with the entire rest of the City on the other. 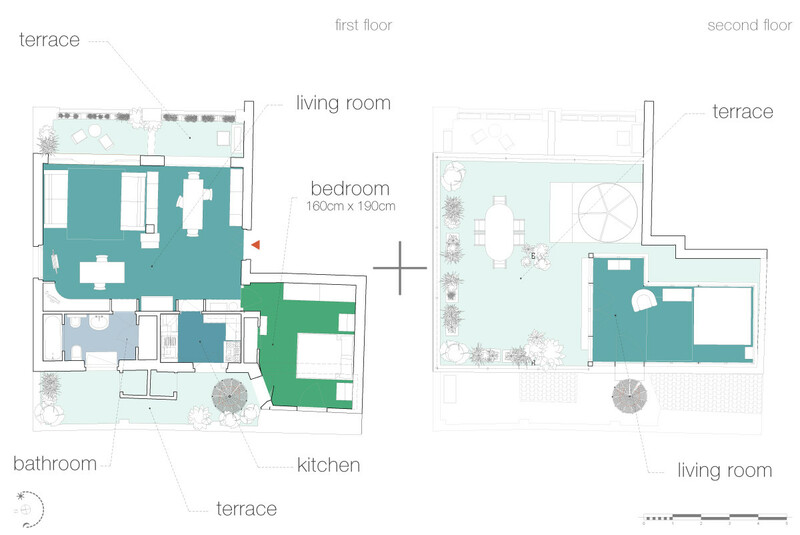 The apartment feels spacious, practical and "lived-in". As some others have mentioned, the shower needs a little attention but it in no way detracts from this wonderful space. We have already recommended it to other friends and the only real down-side to this apartment was the fact we had to eventually leave it. We would have loved to stay even longer! 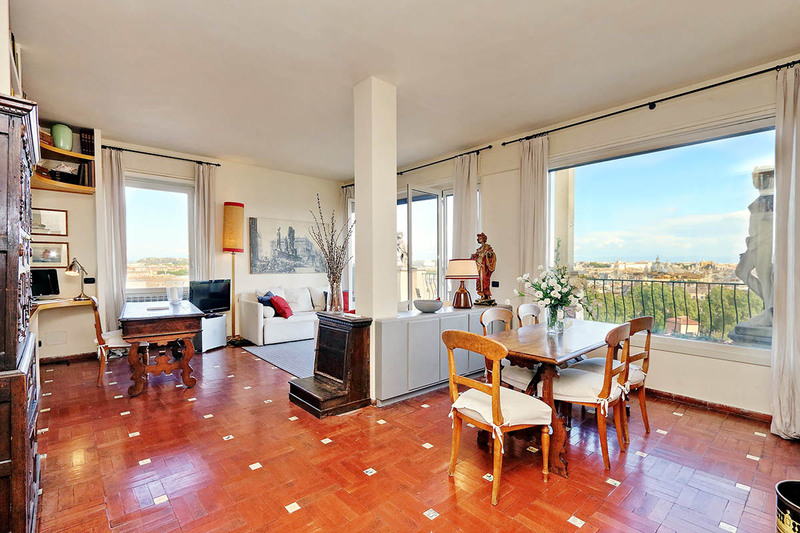 We totally loved this apartment in an excellent location in Rome. The spectacular view speaks for itself (even the best pictures on this site don't do it justice) - it is indeed breathtaking! We were also pleasantly surprised by the super nice location. 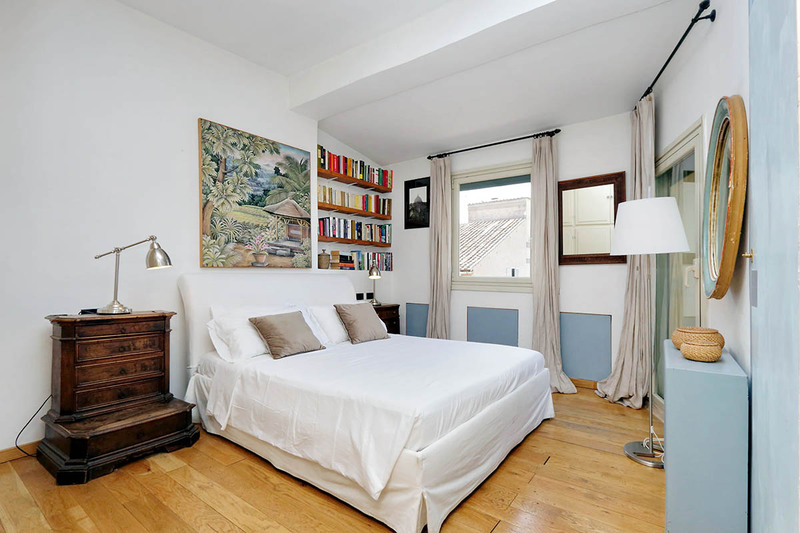 Easy walking distance to Trastevere, The Vatican, Campo di Fiori, and much much more. Ev...Read Moreen with our 5 and 8 years old boys. 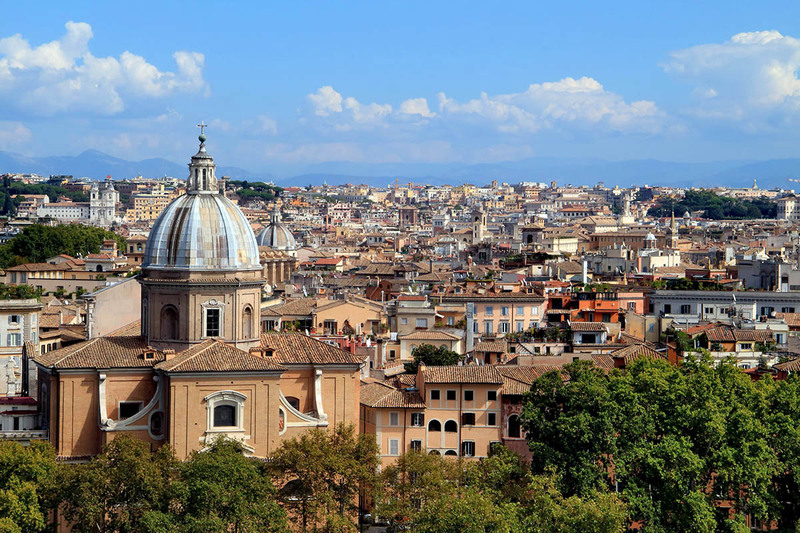 Top tip: There's an OPR (https://www.operaromanapellegrinaggi.org/en/roma-cristiana/open-bus) hop-on / hop-off bus stop just two minutes walk from the apartment at Piazza dell'Oro. Very handy. 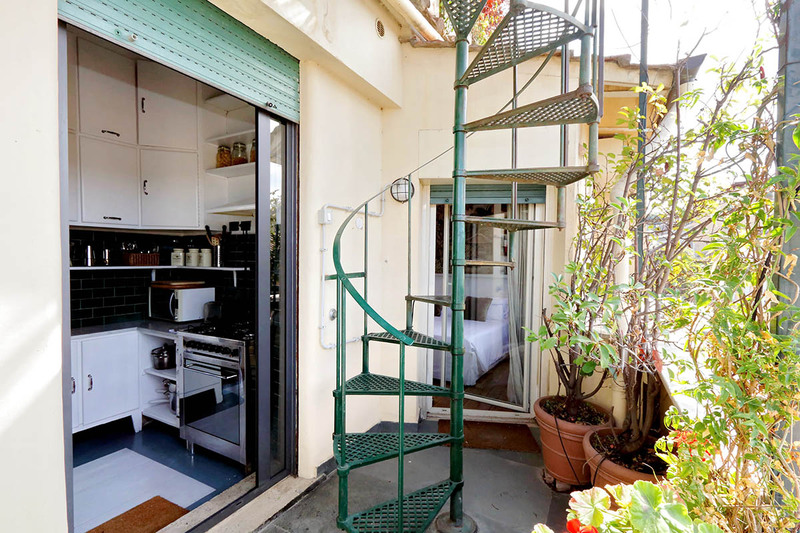 Creo que es un apartamento ideal para pasar unos días en Roma. Perfecta situación para ir andando a los lugares más famosos y entrañables de la Coudad Eterna. 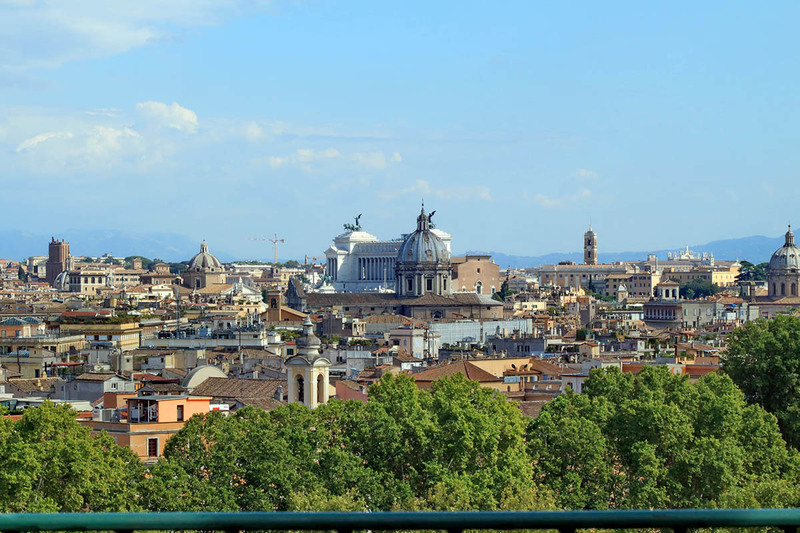 Las vistas son maravillosas y desde la terraza superior puedes girar 360 grados y ver desde la cúpula de San Pedro, hasta castillo de Sant'Angelo, Plaza Cavour y Palacio de Justicia...Read More, basílicas de Santa María La Mayor y de San Juan de Letrán, Monumento a la Patria en Plaza de Venecia, el Monte de Gianicolo y la fachada de La Fontana dell'Acqua Paola, muchas iglesias, etc., etc. Os recomiendo unos buenos prismáticos y pasareis horas contemplando Roma desde la terraza con unas cervesitas y descubriendo los sitios que se ven desde ese maravilloso ático. La única pega no es del apartamento, es de que no hay un buen Supermercado cerca. 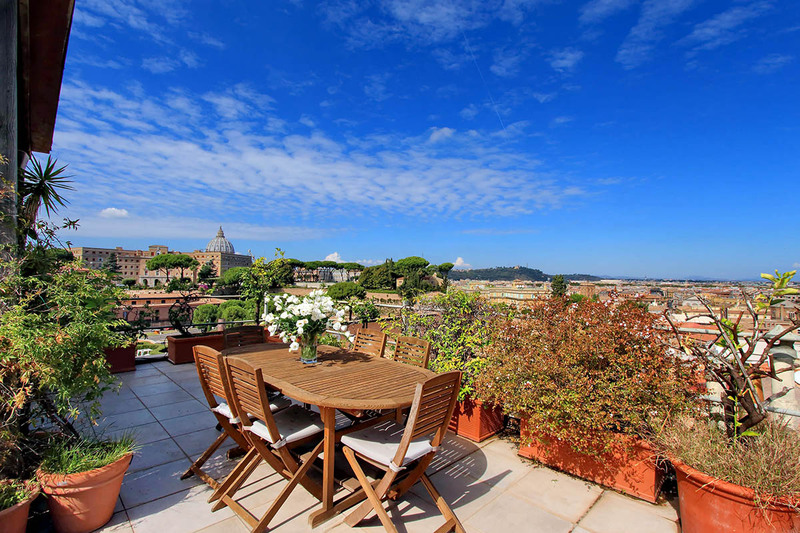 The terraces offer stunning views over the clay roof tops of the centre of Rome. The apartment is spacious and had everything we needed - with the possible exception of sun loungers on the top terrace. At night we slept well as the area is not too busy and the bedroom is around the back. we walked everywhere - but the bus routes are very close to...Read Moreo. We booked this apartment for one reason, the view. We were not disappointed. 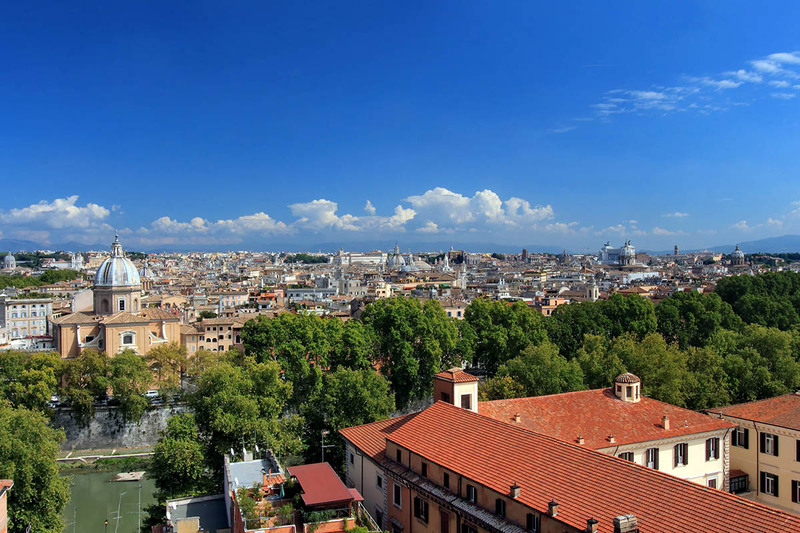 There was even a view of the Vatican from the rear terrace. We were met at the apartment as planned. We were shown around, payment finalised and left to enjoy the fabulous furnishings and amazing view. Kitchen was small but OK. We made use of the washing machine. Shutters ...Read Moreon all the windows ensured a good nights sleep. We could not get a taxi to drop us at the door so be prepared to cart your luggage up or down the steep street. There is a lift in the building. Great communication with Romeloft staff at all times. Highly recommended. The location and views are fantastic - we walked everywhere and there are good local shops, supermarkets and cafes. Recommend booking the airport transfer as it is not easy to find tucked away in a very quiet cobbled street. The apartment has everything you need and the kitchen was great for self catering. The cupboards though are looking tired and...Read More the utensils and knives need upgrading. The bathroom is well appointed but desperately needs a clean and new shower curtain. Living areas spacious and clean and the balcony a great spot for breakfast and coffee. Comfortable bed but wardrobe and cupboard a little quirky and eclectic. 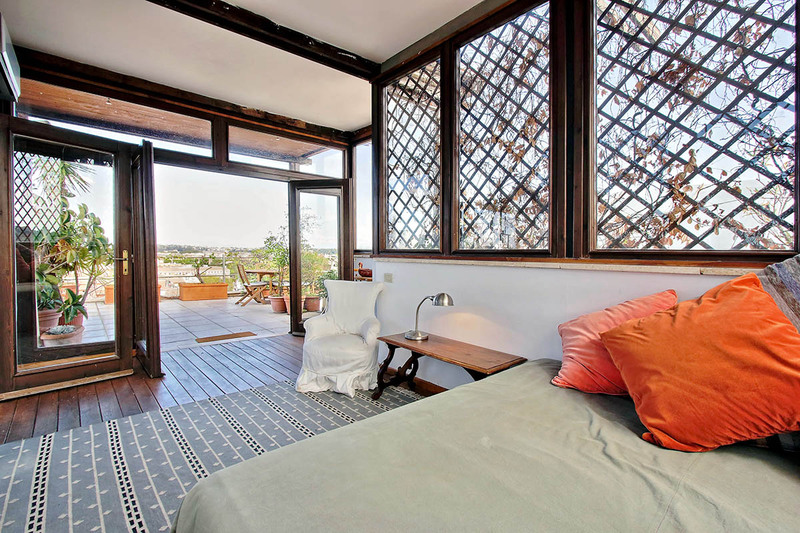 The upstairs room and terrace are fantastic for afternoon siestas or dinners enjoying the spectacular views. We would certainly consider a return visit. Nissar gives us a very pleasant, warm welcome and a clear explanation. The breakfast bin we have ordered was sufficient. 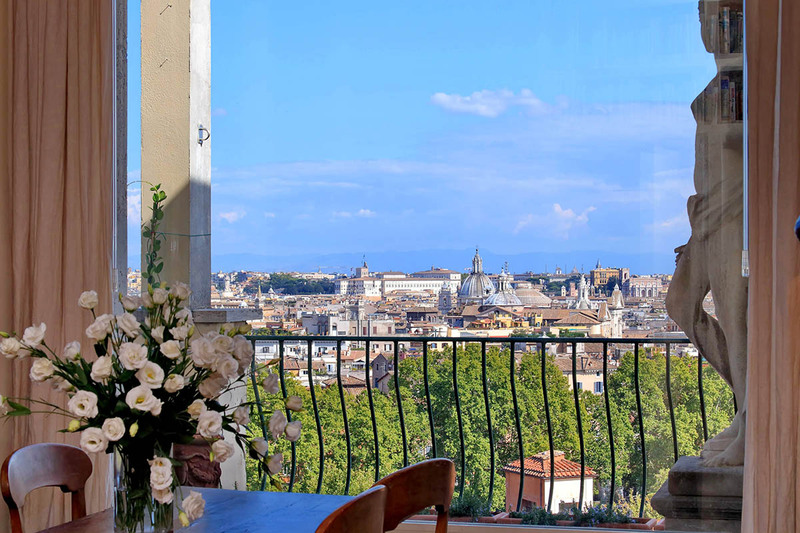 The apartment has a stunning view over Rome. It is more than big enough for two people. The apartment is equipped with comfortable sunscreens. It has a very beautiful and clean stone floor, and nice furniture. 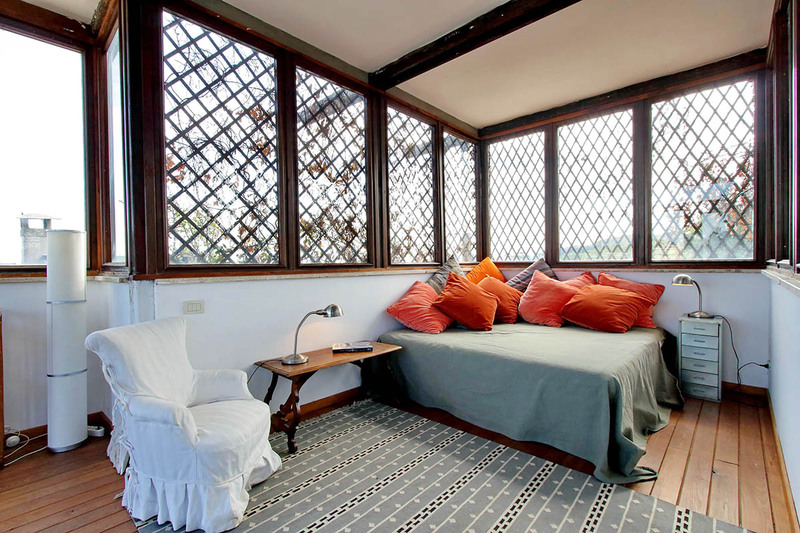 The bedroom is equi...Read Morepped with a very comfortable bed. The room has more than enough big build-inn wardrobes. The finish of the wardrobe doors seems a bit low budget, but they have funny doorknobs.The terrace upstairs is beautiful and big, decorated with nice smelling Italian jasmin plants and a wooden diningtable with chairs. It would be nice if there where a pair of comfortable deckchairs. 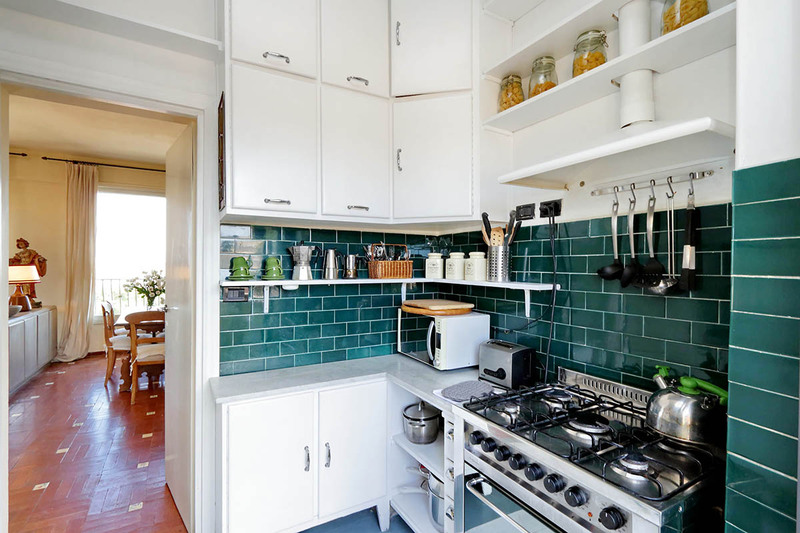 The kitchen is well equipped with a stove, oven, microwave, dishwasher, toaster and percolator. And outside a washing machine. The kitchen cabinets look some old and low budget, but has a nice marble countertop. The kitchen door to the outside balcony needs a second repair, so it could be closed properly. 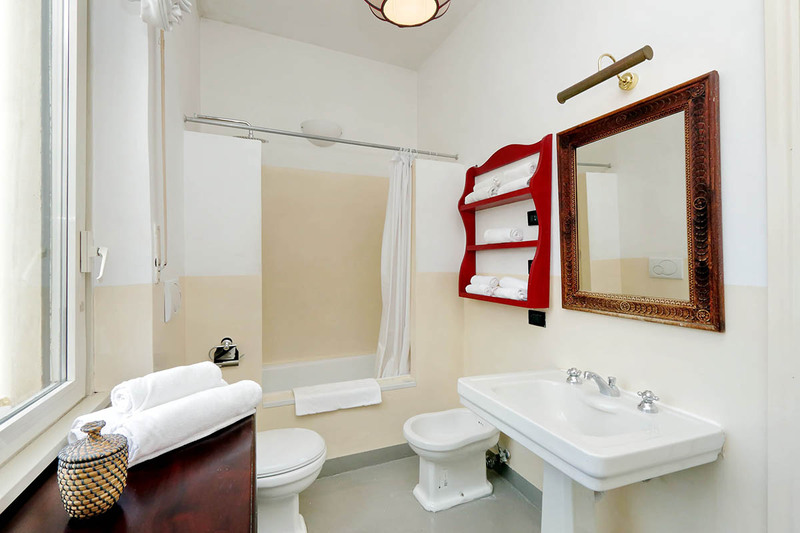 The bathroom is spacious, well equipped with a toilet, bidet, sink and bath with shower facilities and comfortable large mirrors. 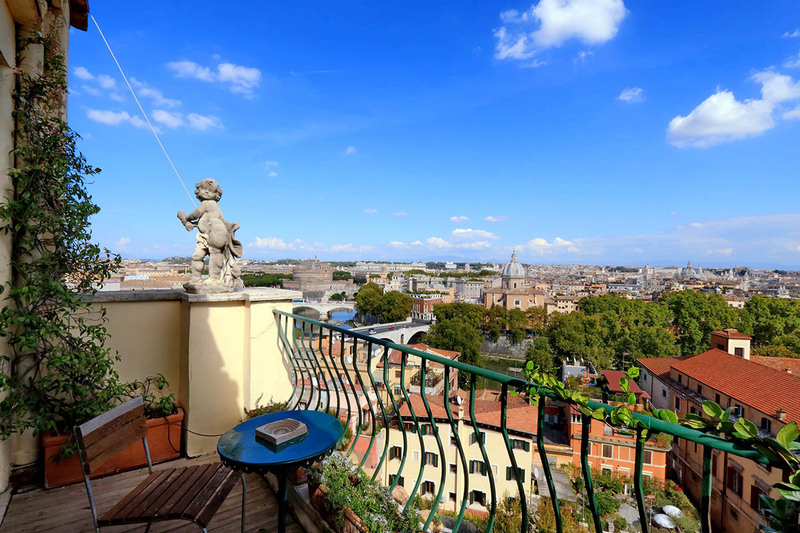 It has a beautiful view to the San Pietro cupola. The sealant seams around the bathtub deserve a makeover. The same applies to the rain shower (is leaking on the side) and the hook for the second shower head (works good, but is placed on a uncomfortable place). The location of the apartment is great. 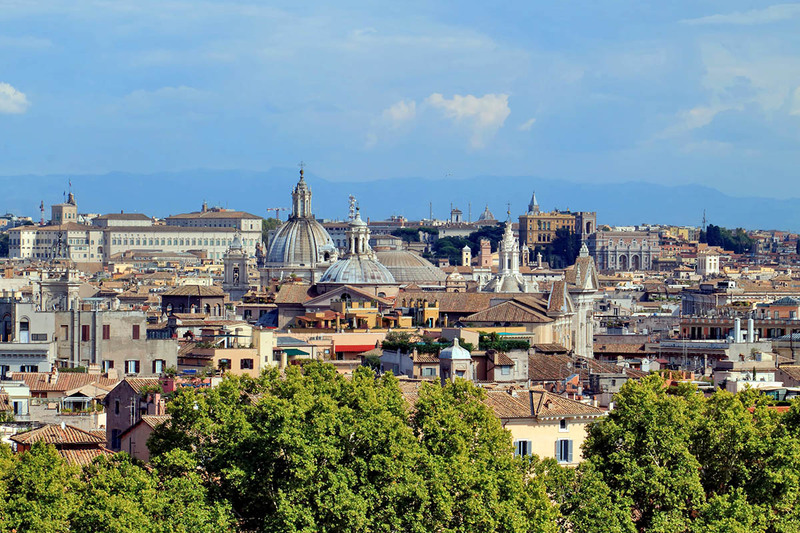 Near the Vatican and within walking distance of piazza Navona and other interesting places. Even though you staying right in town you do not suffer from urban noises. Nissar was there to meet us 10 minutes after we called and helped us get settled. The views of the city were spectacular and hard to beat anywhere else in the city. Location was withing walking distance of most major attractions and restaurants and transportation was easy to get to. We had an amazing time! There is a lift in the building which is n...Read Moreice, but there are still stairs or a steep incline hill to get to the place. Might be tougher for people with mobility issues. But we loved the exercise! The only criticism of the place itself would have to be the shower. The shower head leaked a bit and did not reach out very far over the tub. Enough to get clean - but not the most comfortable. 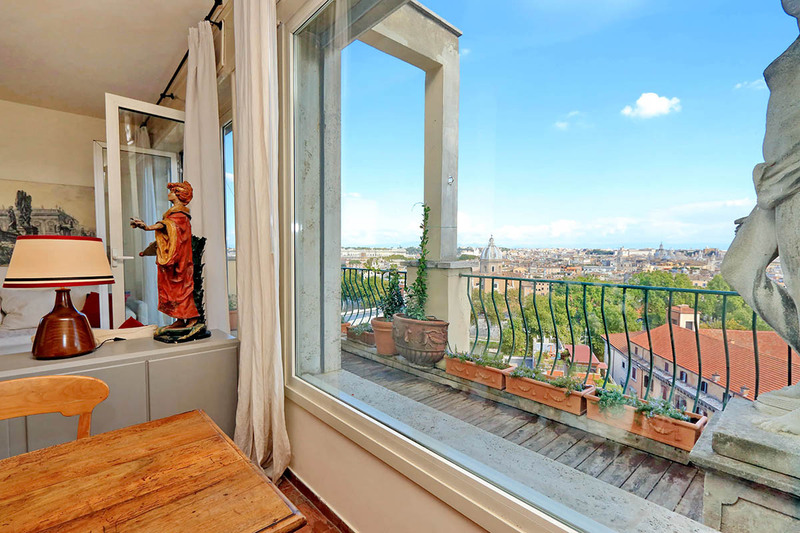 Lovely apartment, light flooded view a breathtaking view over Rome. Cosy, personal interior. Still on the ok side of shabby chick, with some tacky closets/drawers. In need of major maintenance. Dishwasher drains dishes with chalk, terrace doors and windows cannot be closed properly. Staff was friendly, we never got enough bedsheets for three pe...Read Morersons though, had to share one blanket throughout the week. The heating was off when we arrived, the apartments had 13°C when and it took it one day to warm up. Outside it was cold, windy and rainy, so our first day was kind of spoiled. Once warm, everything was fine. Anyway, apart from these minor discomforts, we loved the place and would definitely go there again. 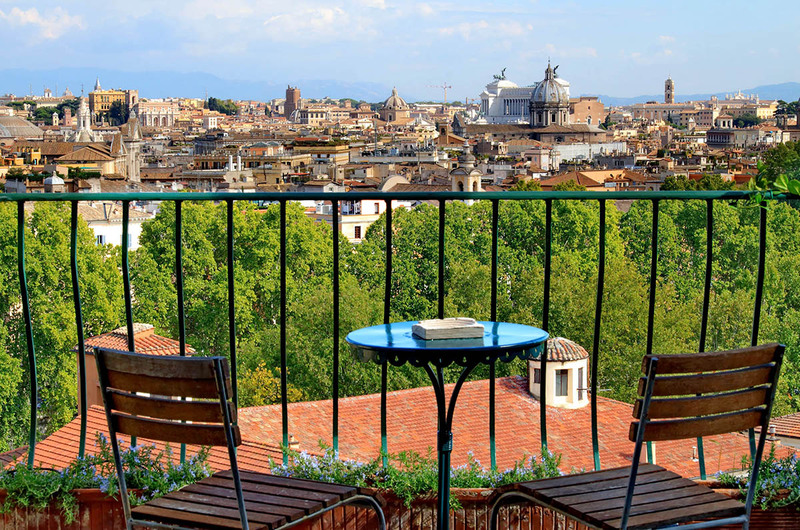 Trastevere and most sights are a short walk away, if you ever wish to tear yourself away from the terrace. The apartment is excellent; we actually spent more time in it this year in comparison to our stay last year - it felt like home from home. The wifi has been improved hugely and RomeLoft supplied 2 fans to help combat the extreme heat. The air conditioning isn't brilliant in the flat - especially in the bedroom - but the little room on the te...Read Morerrace is perfect for sleeping in. The flooring has been sorted and there was a new kettle and lots of supplies of coffee etc in the kitchen. Oh, the views! 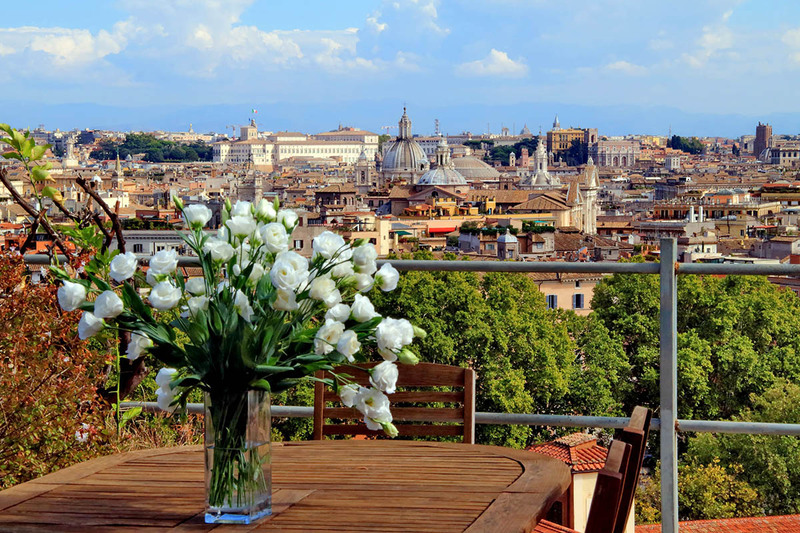 We spent hours on the terrace gazing at Rome and enjoying a relaxing holiday. The car service was great; Mr Honey was very welcoming. We'll definitely go back and recommend this apartment highly. The view from the apartment was truly fabulous, and also the interior decoration was very nice and stylish. The location was perfect and we had a fantastic stay. The drawback was the indoor temperature at nights and the low standard of the bath room, where the water wouldn't go down the drain in the bath tube. Overall the view and the apartmen...Read Moret was amazing. To be more detailed, somethings that could need improving are: -the mould around edge of bathtub is not attractive -the water drains very slowly from the tub drain -be more generous with towels (an extra big towel per guest would be great), toilet paper, soap, glassware (only 2 wine glasses), tissues, etc. Doing so would give your guest a great ...Read Morefeeling of graciousness. 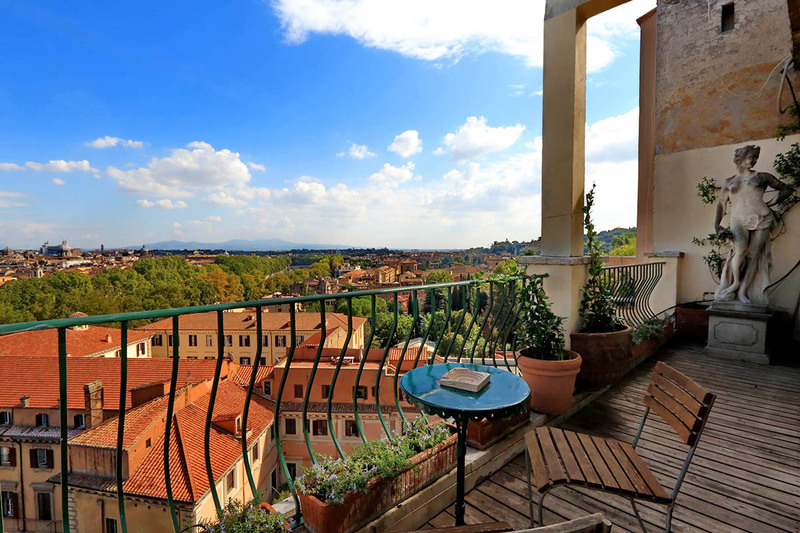 The views, terraces and balconies are wonderful. We spent many happy hours on the roof terrace swing watching the inspirational dawns and sunsets. The towels and linen were spotlessly white, as were the day sofas which, judging by our use, must get a lot of wear. Crockery, cutlery and kitchen implements were generous. The books, guides, magazin...Read Morees, maps and wifi connections were much appreciated and well used by us. This is a wonderful, very atmospheric apartment, surprisingly quiet considering its central location, which we loved living in for five days. We actually did little self-catering as there is a wonderful trattoria on the riverside four minutes walk away, and several more within easy walking distance. 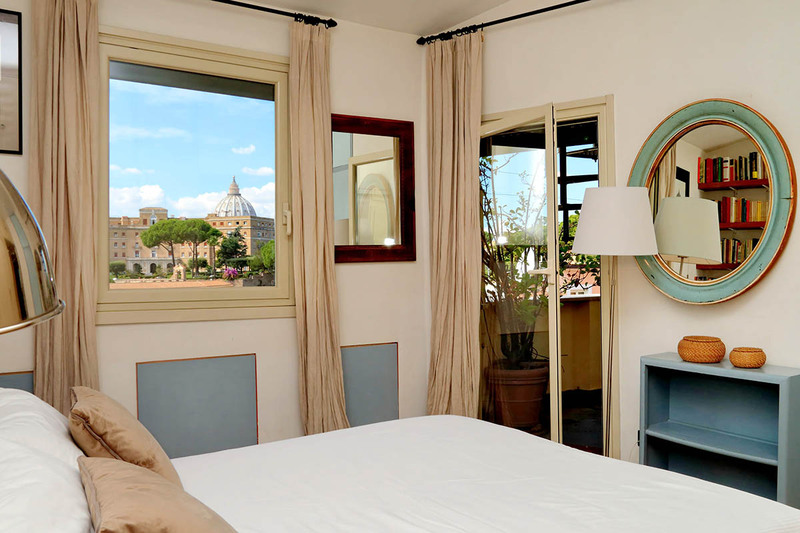 Trastevere is a 25 minute walk along the river and is a fascinating area away from the bustle of central Rome. This apartment is absolutely wonderful; the location, the views, the comfort, the lift to the 5th floor. 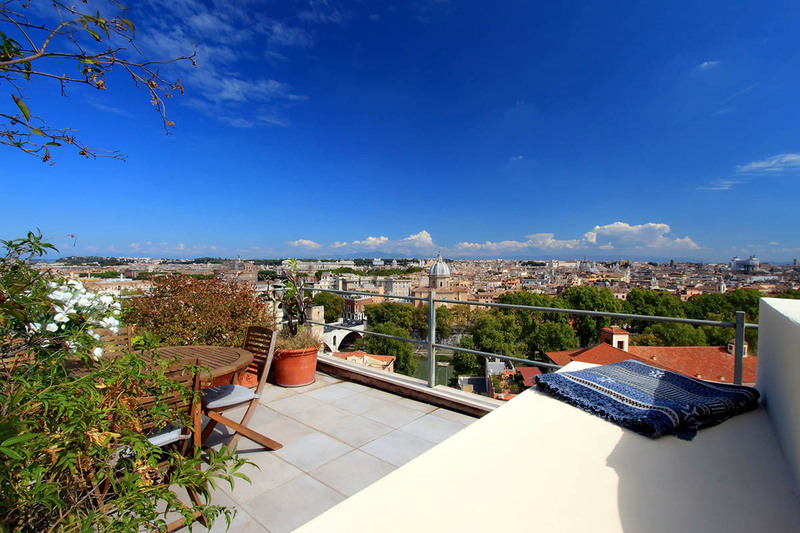 The whole of Rome is laid out in front of you as you sit on the little balcony or on the panoramic terrace. Every window you look out of shows you another stunning view. 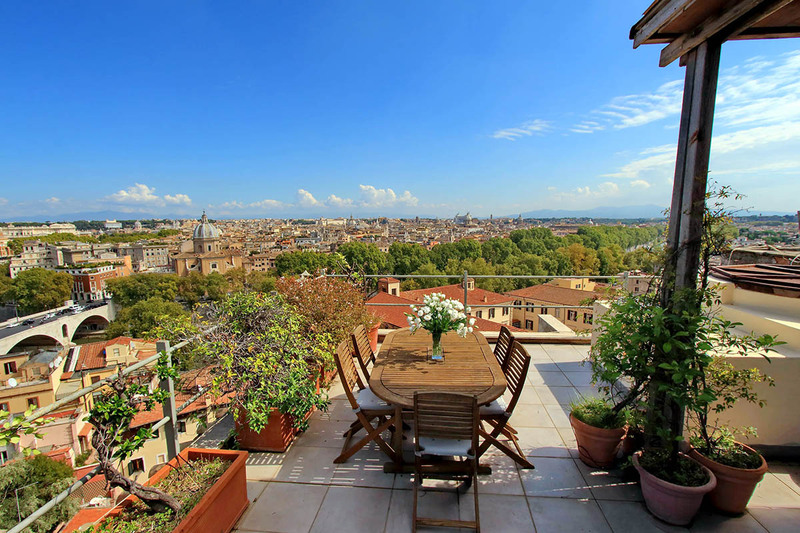 The apartment is spacious and well fitted and the terrace is out of this...Read More world. An earlier review suggests that at least one rotating fan should be put in the apartment; we agree with this. The a/c was not really adequate; nothing at all in the bedroom and only one unit in the living room. We struggled to sleep at night because of the heat (our visit was in late August/early September). We really couldn't fault anything else and would also highly recommend hiring the car service to and from the airport. The driver was fabulous and stopped to show us many sights on the way. We're hoping to book again now for next year. I booked this for the view, and what a million dollar view it is! 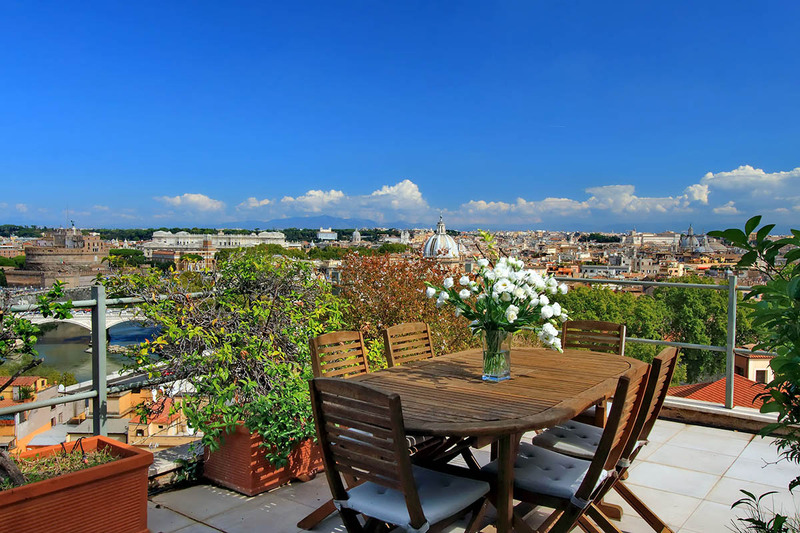 The whole of Rome seems yours, and just as you are sipping your chilled wine on the terrace,picking out the landmarks and thinking it couldn't get any better, a flight of emerald green parakeets swoops across the sky. Sublime. Take binoculars, and get up very early one morning ...Read Moreto watch the sun rise in front of you, turning the grey domes to gold. 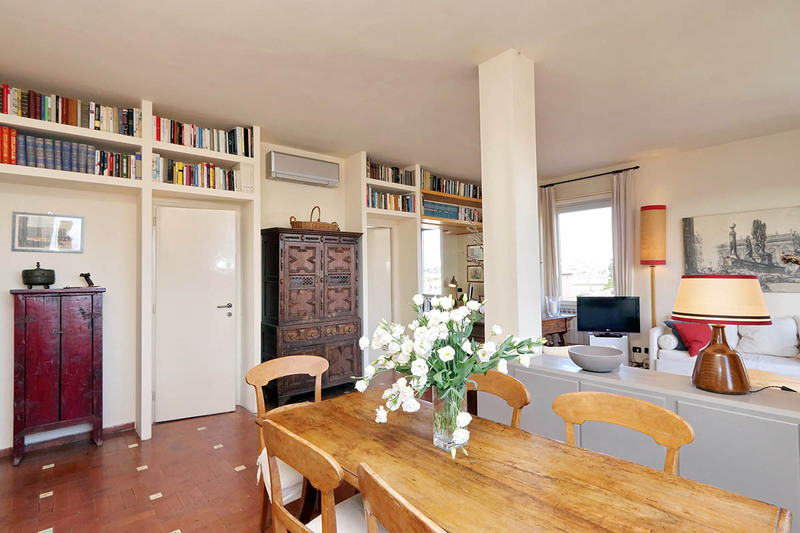 The apartment is pleasant and homely, a nice selection of books and plenty of room. Bed and big fat sofas very comfortable. There are a few niggles, and if you are particularly fond of luxury this might not be for you. Although a bathroom is described, you can't actually use the bath (no plug or taps),the shower head needs replacing and the tiles regrouting. It is also a shame that no kettle or toaster is provided as this would make breakfast-making easier. And please provide washing up liquid, its annoying to spend part of your precious break hunting down a supermarket when it would only cost a few cents a visit to provide detergent! But all these pale into insignificance beside the endless pleasure of the architectural pageant of Rome at your feet. We used the car service, but were badly served on arrival. Our 'driver' wouldn't speak to me at the airport, after 15 mins we had to carry our own bags to the car some distance away. Then we were driven to a grim car park behind a factory,where some goon-looking types were waiting. Told to get out, and exchanged like goods for another passenger, finally driven off in another vehicle which stopped at the top of the hill, refusing to drop us outside the apartment, so we had to drag our bags down a very steep hill. Wierd, rude,a bit frightening, and not recommended. This was a fantastic apartment with a great location. The view from the upper terrace is phenomenal. The pictures truly do not do it justice as it is nicely decorated, comfortable and even more than we thought. Anyone who is trying to decide between a studio or this apartment - pick here, you won't be disappointed. It is a 10 minutes walk ...Read Moremax to the Vatican and it is very easy to get to great food, shopping, and other sights in Rome from here. My sister and I stayed for a week and would highly recommend this location and this rental company. This apartment is stunning and our visit was tremendous. The space is clean and artful, and the views were way beyond our expectation. The bedroom was very comfortable, and the kids enjoyed the day beds in the main room. 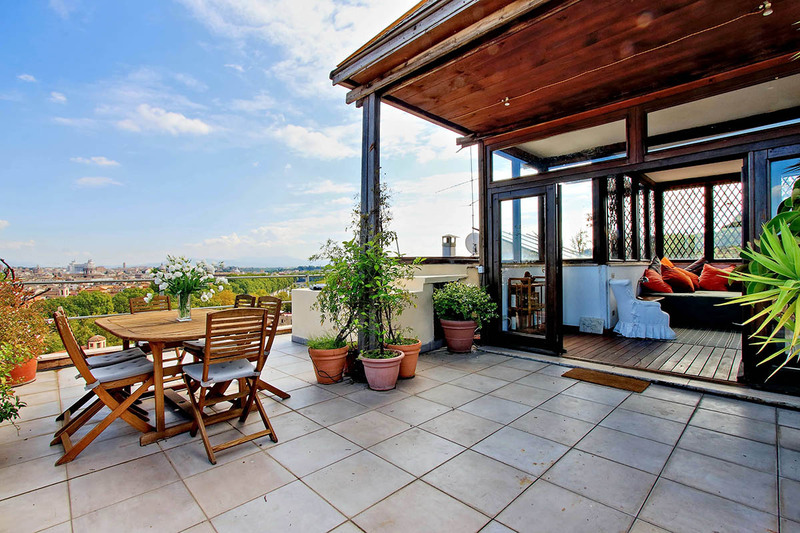 Upstairs there is another room and another spectacular deck with views of the city. 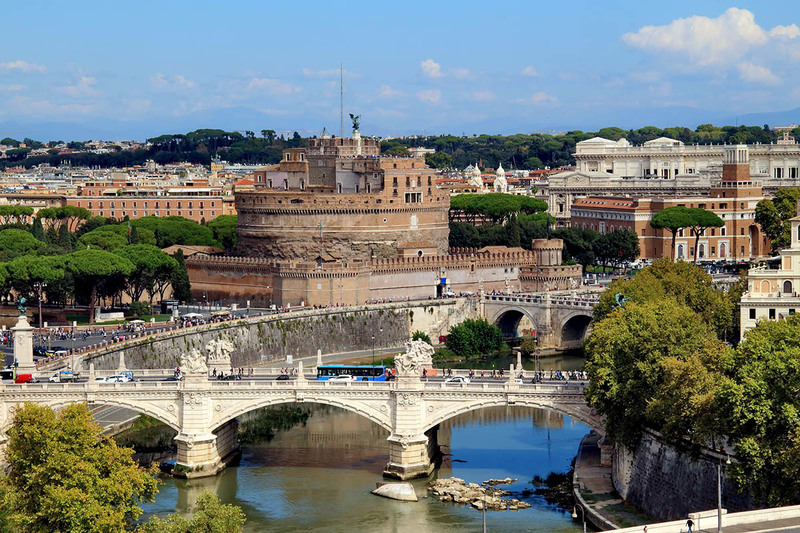 Vatican City is just a few minutes away, ...Read Moreand most other major sites are easily walkable too. Upon arrival, we decided to use Rome Loft's car service to greet us at the train station. The driver was on time and very courteous. When we arrived at the apartment, the driver had coordinated with the manager, so we were greeted with the keys and a tour of the apartment. We also used the car service to the airport on our final day. We cannot imagine a better experience in Rome! We highly recommend Romeloft - the service they provided to us was faultless. The views from this apartment are nothing short of stunning, both day and night. The fact that there is an elevator in the building was wonderful at the end of a days sightseeing. The apartment has everything you could want, in a rather unconventional way, that may not s...Read Moreuit everyone. 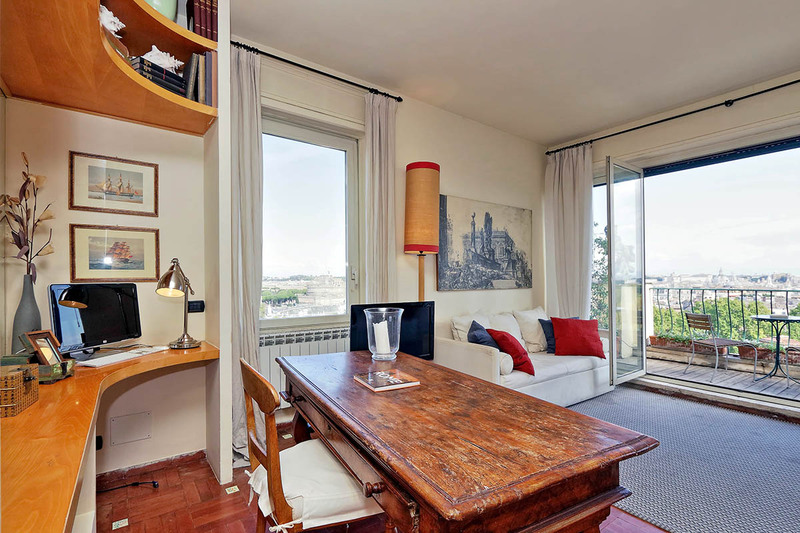 The photos on the web site show the apartment and views exactly as is. We greatly appreciated the free WIFI service provided, and would definitely stay here again. 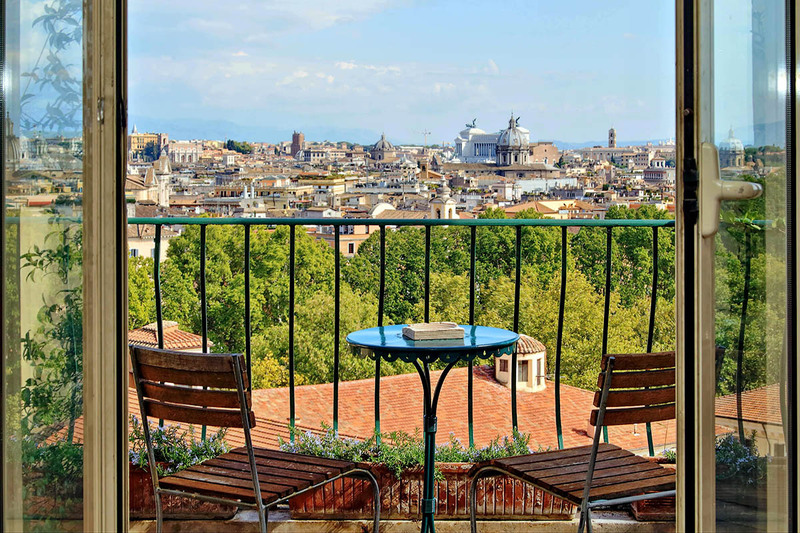 Morning coffee on the terrace overlooking the great sites of Rome; nights sitting in bed looking out at the Vatican all lit up - what more could we ask for? The views were spectacular, just as the photos show only so much more impressive in reality. Our 3 night stay in this apartment was thoroughly enjoyable. We loved starting out and ending our...Read More days looking at the views. Romeloft people were excellent to deal with. They responded quickly to emails. They arranged car service from train station and to airport. Mr. Honey gave us great recommendations for restaurants and tips for sightseeing. The location was great. We walked everywhere. We were concerned about heat in the apartment because it has no AC. We need not have worried because there were strong cross breezes that kept the apartment cool once the windows were opened. The only downside to the open windows was the noise of the city. We were so tired at the end of our days that we slept through it. We just got back to New York and are already recommending this apartment to everyone we talk to. 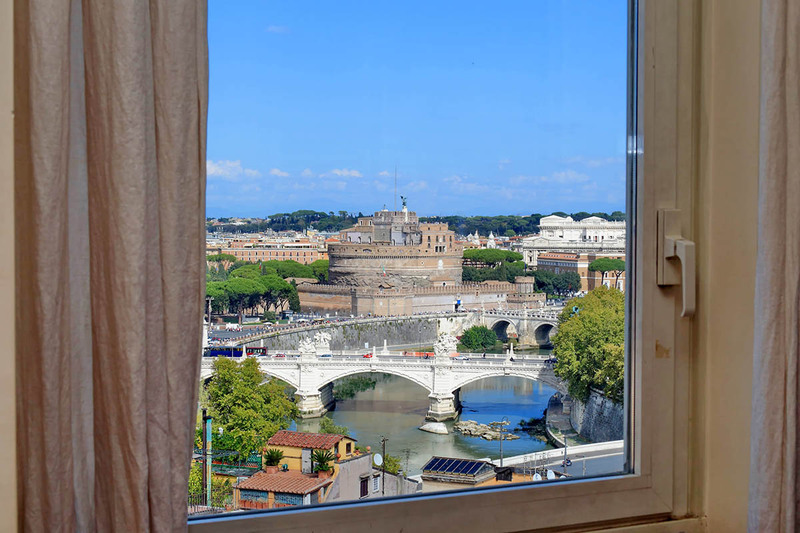 Un appartement de rêve par la vue inouïe qu'il offre sur Rome. Un lieu d'exception, très bien situé, à ne pas manquer pour profiter de l'ambiance unique de la Ville éternelle. Séjour inoubliable. Merci à toute l'équipe. We had wonderfull time in Rome. Thanks to romeloft and espeshially to mr. Hony. Your attitude was very professional and friendly. 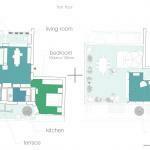 Talking about the apartments, it is a sensational and a very special place... I wont write about the breathtaking view, because it's better to see. About wonderfull books, because it is better to read. I'll ju...Read Morest tell, that from the first moment we felt home. When we needed to turn on the light, we just reached out our hands and felt the switch exactly there. We stayed for three nights at the end of March in the apartment. 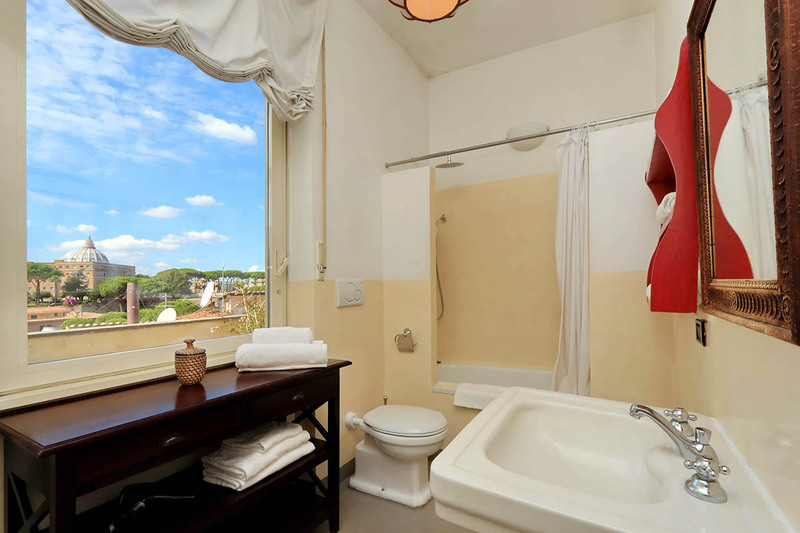 It has wonderful views of all of Rome. 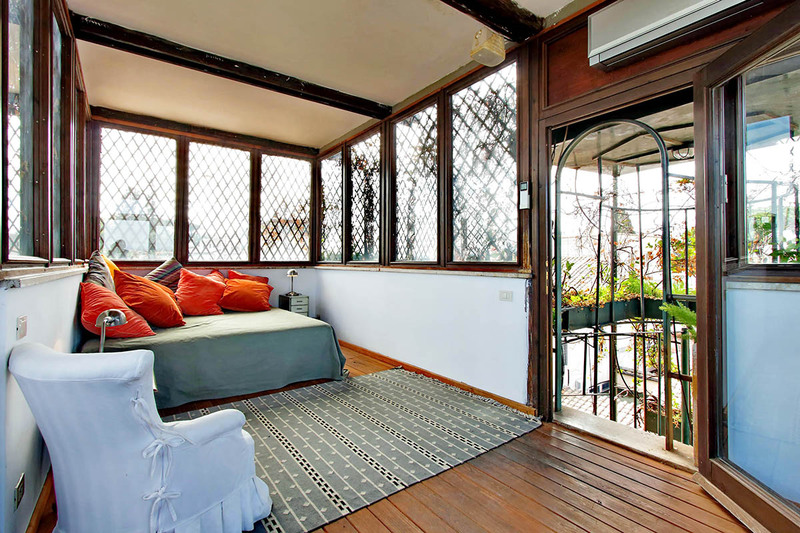 It has a sunny balcony from the lounge and a further terrace above. 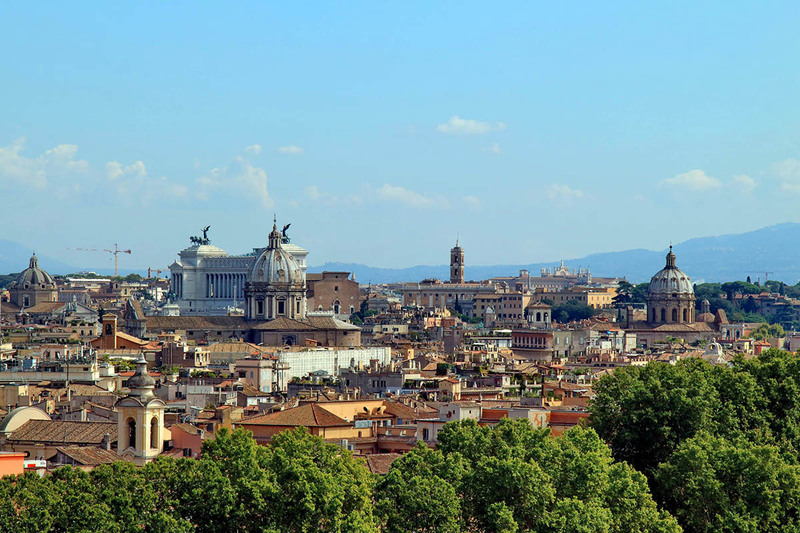 It is centrally located and very easy to access Rome from here. The Vatican is a 10 minute walk and everything else is across the river but only a 20-30 minute walk away to most ...Read Moresights. The bedroom has a king size double bed and is extremely comfortable. We did not use the sofa beds in the lounge area. The kitchen has basic itensils but we ate out mostly so did not use it apart from drinks. We would definitely return to stay in this apartment. It is light and airy but the views made it for us by far. We hired a taxi from the airport through loft Rome. The taxi from the airport to the apartment was a "crazy fast ride" but the taxi driver on the return journey was absolutely fine. we arrived a little early, and our taxi driver did not know where to drop us off. We were a block away at the bottom of 100 steps. I called romeloft, and was told how to reach our building, and that someone would come immediately to let us in. We were shown the apartment and how to use everything by a very nice young man. He took me up to the upper...Read More terrace, and I gave a kiss on the cheek, because it was everything I had hoped for in location and views. the apartmt was very comfortable. we loved that we could open the terrace doors and get a breeze. We only used the cute little clothes washer and the microwave oven, so I can not report on all the appliances. We loved the location, because we could walk to so many of our destinations and the view was breathtaking from our terrace and dining area. We enjoyed wine and cheese on our upper terrace and just resting in the evening looking at all the lights. We were very thankful for the elevator also after climbing Rome's hills all day. What I liked least: the hot tub was broken, and some of the floor on the lower terrace looked like it needed to be replaced. Neither bothered me in the least. It was just an observation. Lisez nos Termes et Conditions pour plus d'informations sur la réservation et les réponses aux questions fréquemment posées à l'arrivée / départ. © Rome Loft: Appartements à louer à Rome. RomeLoft.com s.r.l - P.I. / reg. number: 11503561000 - Siège social: Via Oslavia n. 30 - 00195 Roma - Italy.